Includes how to purchase another state, and what to do with all those old Maptech/MyTopo CDs and DVDs. From its inception over 20 years ago, TNP has always been a modular system: a single install for the main Windows PC application, and a separate configuration process for each state. While the technologies have changed, that fundamental design has not, and every effort is made to maintain compatibility with older collections of Professional USGS Topographic Series disc sets. Visit terrainnavigator.com and Login with your TNP Username and Password. If you have misplaced them, open the File menu of Terrain Navigator Pro on your Windows PC and choose Preferences, Subscription and User Account. Your current Username and Password will be displayed there. 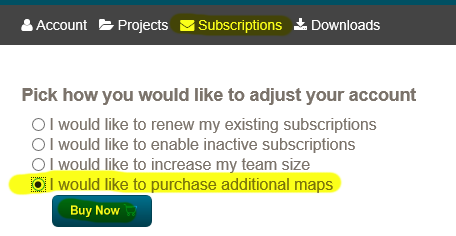 Once logged in, click Subscriptions; then select I would like to purchase additional maps, then Buy Now. On the map of the US, click the State(s) you wish to purchase access to. Do not click states that you have already purchased, unless you wish to add additional licenses for those states to your account. If you desire the Private Land Parcel boundary/ownership layer for that state, click "Add Premium Ownership to my subscription." Select Purchase and Download, then click Next. When satisfied with your order, click Next to continue with the payment etc. 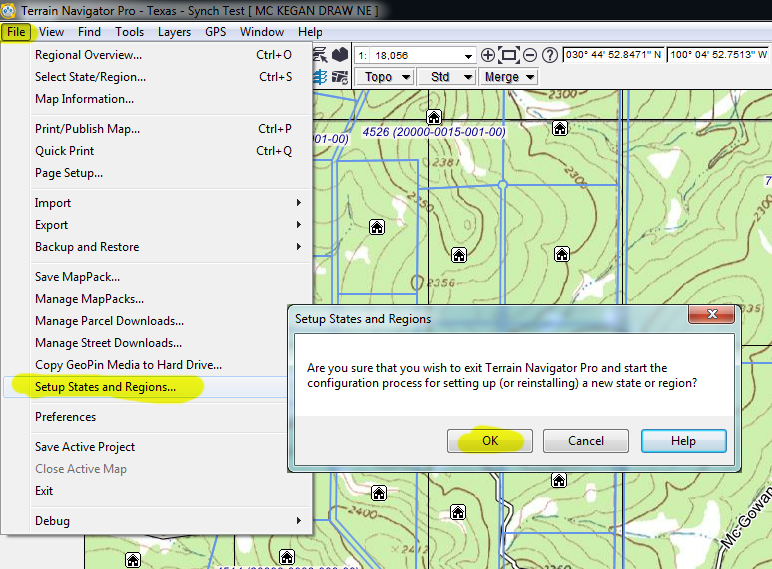 Then follow the instructions below on how to add the new state to your copy of Terrain Navigator Pro. Of course, if you have any questions about this process, or would prefer to speak with us on the phone, we are glad to help. Please call us at 800-627-7236 x204. Start Terrain Navigator Pro on your Windows PC. Open the File menu and choose Setup States and Regions. (Note: this is not the same as Select State/Region, which may be disabled.) Click OK to exit TNP and start the configuration process. You will then be presented with a Configuration and Geographic Database window with three options. Choose I want to download the state from the Internet and press Next. If you just purchased a state, and it is missing from the list of states that are already registered, please call us at 800-627-7236 x205 or email TNPSupport@trimble.com. If you have an older disc set that you are installing, and it is missing from the list, refer to the next question, below. After confirming the licensing for your state, the registration will be complete. Press Next to start the download and installation process. This will take several minutes, depending on the speed of the Internet connection and the geographic size of the state/region being installed. Once the download begins, it will proceed through all of the various operations automatically, and no further intervention will be required until it has completed. Then start TNP and enjoy your new state! I have old discs that I purchased years ago. How do I install them? 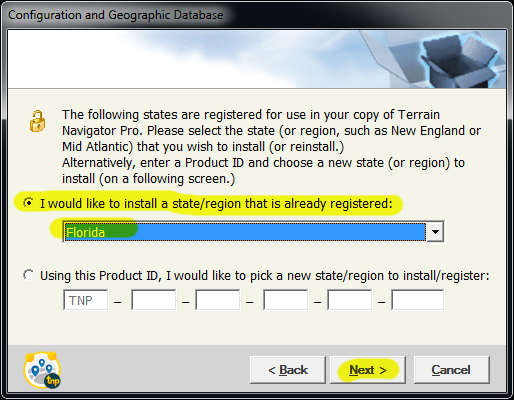 Usually, all states that you purchased for use in Terrain Navigator Pro are already registered into your TNP account. This greatly simplifies the process – and the discs and the Product ID aren't even needed. 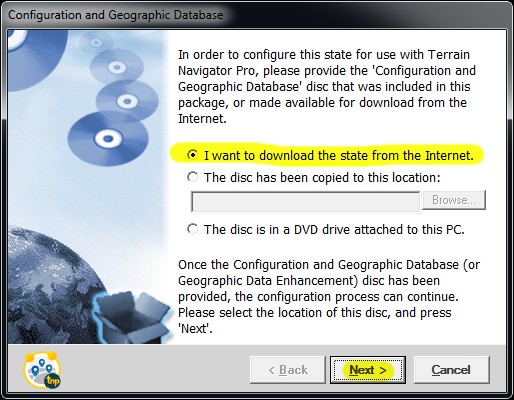 Just follow the same steps above for installing a new state purchased from the terrainnavigator.com web site, selecting the desired state from the list of those available. If the state/region is not shown in the list of those that are already registered, select the second option to use a Product ID. Be sure to enter the Product ID that was issued for that state, and not one that has been used previously. The Product ID should begin TNP-002 or TNP-003 (other Product IDs do not apply to Terrain Navigator Pro disc sets.) If you are unsure of your Product ID or have questions, please call us at 800-627-7236 x205 or email TNPSupport@trimble.com. I got a new disc set by purchasing it directly from you (or one of your resellers.) How do I install it? As with any state you wish to add, start Terrain Navigator Pro on the PC, open the File menu, and choose Setup States and Regions. When prompted, insert the Configuration and Geographic Database disc that was included in your set, then select the option that the disc is a DVD drive attached to the PC (or, if a DVD drive is not available, provide the location where the disc has been copied) and press Next. Then proceed through the registration procedure, supplying the Product ID for that state, if needed. Once the Configuration and Geographic Database disc is copied, insert and copy the Professional USGS Topographic Series discs, when prompted. When complete, start TNP and enjoy your new state! I have a slow Internet connection. Can I use discs to install? Yes. New purchases of TNP can (optionally) include the physical media. Just check the Purchase and Ship DVD option when placing the order (an extra fee applies.) Once they arrive, use the same procedure above for installing old disc sets. I want to install using the DVDs, but my computer does not have a DVD drive. How is that done? First, using another PC so equipped with a DVD drive, copy each disc into a separate folder in a location (network, USB thumb drive, etc.) that can be accessed by the other PC. Ideally, create a new folder such as "TNP", then a subfolder for the Configuration and Geographic Database disc ("TNP\Calif_Config") and a subfolder for each Professional USGS Topographic Series disc ("TNP\Calif_North", "TNP\Calif_South"). Then start Terrain Navigator Pro on the PC, open the File menu, and choose Setup States and Regions. Select the option that the Configuration and Geographic Database disc has been copied to a location, specify it, and proceed through the registration and installation process. Note: This assumes that you are running a current (post version 11) copy of Terrain Navigator Pro. Version 10 (or prior) does not include the abilty to install from a location other than a physically-attached DVD drive. I have just a Product ID. How do I add a new state with it? As with any new state, start Terrain Navigator Pro on the PC, open the File menu, and choose Setup States and Regions. When prompted, choose that you want to download the state from the Internet. On the Next screen, select Using this Product ID, I would like to pick a new state/region to install/register and enter your Product ID. After registration, you will be able to pick the state you wish to download and install. I have a collection of USGS Topographic Series discs that were sold with Maptech's Terrain Navigator standard (not the "Pro" version.) Can I use these with Terrain Navigator Pro? No. These discs are not compatible with Terrain Navigator Pro. Instead, please purchase a new subscription for that state. I lost my Terrain Navigator Pro discs. Can I still install them over the Internet, even though my subscription has lapsed? So long as at least one state is installed already, and the other states were registered correctly, yes. Start Terrain Navigator Pro on the PC, open the File menu, and choose Setup States and Regions. Select the option to download the state from the Internet, and on the Next screen, select the state from the list of states/regions that are already registered. If TNP has been completely uninstalled, or you are installing on a new computer, and at least one state has an active subscription, log into terrainnavigator.com, click Downloads, open the TNP Desktop Software Installer discs and Downloadable Updates section, and then download/run the TNP New Installs: Installation downloader. Proceed through that process to install your first state, and then use File, Setup States and Regions to add any additional states, if any. I purchased TNP before the December 2016 switch to a subscription-only "software as a service" license. Do I need an active subscription to install on a new PC? What am I missing by not having an active subscription for my state? I have a large number of installations of TNP to deploy across my organization. Can I download the discs once to a central location, and then use them for installation? Yes. Log into terrainnavigator.com, and choose Downloads. In TNP Desktop Software Installer discs and Downloadable Updates, download the TNP Installer DVD (ISO image) [for advanced users]. In the State-Specific Downloadable Updates and DVD Images, download the Configuration and Geographic Database (DVD image for advanced users) and Professional USGS Topographic Series (DVD image for advanced users) for your state(s). These are all ISO images. Then, using the DVD software of your choice, extract each ISO image into a separate sub folder. For example, you may have folders called "TNP\Installer", "TNP\Calif_Config", "TNP\Calif_North", and "TNP\Calif_South". Then from each PC, run the Setup.exe found in the Installer folder. When prompted for the location of the Configuration and Geographic Database disc, specify the path that was previously set up. There are many other tricks for large deployments of TNP, including silent script-based installs. Please contact TNPSupport@Trimble.com for a whitepaper containing Advanced Installation Instructions.